A minor update of the NetApp Technical Report (TR) PowerShell Collector Script: Version 2. 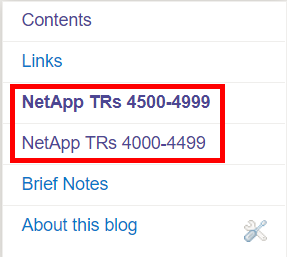 I’ve been doing a bit of blog house keeping and moved the NetApp TR catalogue into dedicated pages, and have the links to these pages in the sidebar. The script is updated to get the PDF titles from the new pages. The updated script allows me to have multiple source pages, rather than one big one. The new pages have the HTML links to the TRs.